No smörgåsbord would be complete without one of Scandinavia’s most distinctive dishes, gravlax. Called gravet laks in Norway, gravad lax / laks in Sweden and Denmark, graflax in Iceland, and graavilohi or tuoresuolainen lohi in Finland, the name literally means “Grave-Salmon” and refers to the medieval practice of curing the raw fish by burying it in the sand above the high tide level. This is a preserving method still used for preparing hákarl (“putrified shark”) in Iceland, for rakfisk (“rotten fish”) in Norway, and for surströmming (“soured herring”) in Sweden. But don’t be put off by the name or by the associations! Cold-cured with sugar, salt, and fresh dill, modern gravlax has a fresh, delicate flavor and is delicious served either as an elegant appetizer or as a topping for smørrebrød, open-faced sandwiches. 2 bunches of fresh dill (don’t skimp on the dill, for this is what gives gravlax its unique flavor). While gravlax is normally prepared using a salmon fillet with the skin on, it works equally as well to use a skinless fillet if that is what is available at your local market. Wait and freeze the completed gravlax at no higher than -10 F (-23 C) for 7 days. This will kill any microorganisms in less-than-fresh fish. Rinse the fish and pat dry with paper towels. Examine the fish for small, opaque pin bones, feeling down along the middle line and along the outer edges of the fillet. Remove any bones with tweezers or needle-nosed pliers. Cut the fillet into two equal halves. Combine the sugar and salt, then cover both sides of each fillet half with the mixture. Wash and roughly chop the bunches of dill, stems and all. Sprinkle the flesh side of each fillet half with the dill seeds and ground pepper. Next, place one fillet half, flesh side up, in a dish just large enough to hold it. Place the chopped dill on top of this fillet, then cover with the second half, flesh side down. It will look like you have a huge raw fish-and-dill sandwich! Cover the dish lightly with plastic wrap and let marinate at room temperature until the sugar-salt mixture has melted into the fillet (but no more than 6 hours. Skip this step entirely if you are making your gravlax in hot weather). Place a small pan or plate on top of the plastic wrap-covered gravlax. Weight the plate lightly, using a few rocks or canned items (in lieu of the traditional sand and dirt!). Refrigerate the weighted gravlax for at least 2 days (48 hours) and up to a week. Every 12 hours, turn the fish “sandwich” over in the brining liquid that has accumulated in the bottom of the pan to ensure that all parts are evenly marinated. Re-cover with the plastic wrap and the weighted pan and return to the refrigerator. Remove the gravlax from the refrigerator. Scrape off most of the dill and seasonings; pat dry with paper towels. As a reminder: if you are not using sushi-grade fish or commercially frozen fish, this is the point where you will need to wrap the gravlax well and place it in a -10 F (-23 C) freezer for 7 days. Using a sharp knife, cut the cured gravlax into paper-thin slices, pulling each slice away from the skin (if your fillet has the skin on). Layer the gravlax slices on crispbread or rye bread. Traditionally accompanied by sweet dill mustard sauce (in Swedish, hovmästarsås), gravlax also pairs well with capers and finely chopped onions as an appetizer or with a variety of garnishes on an open-faced sandwich. 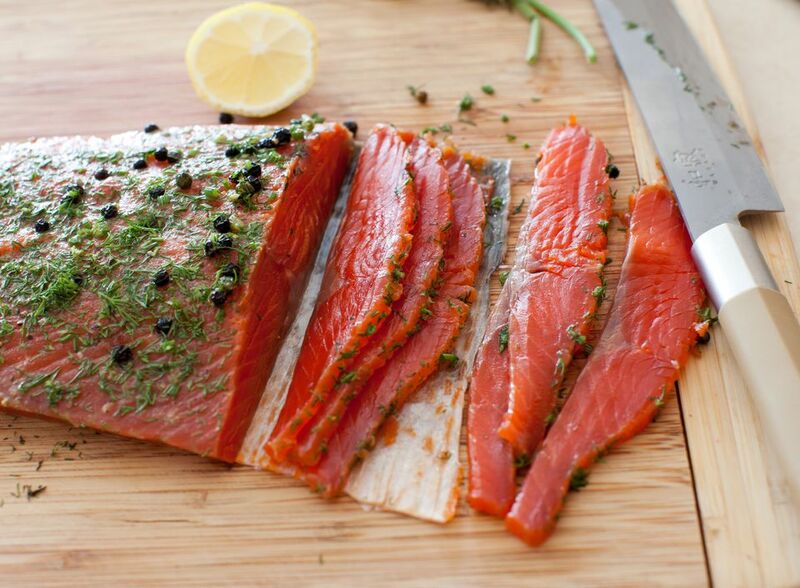 Gravlax can be stored in the refrigerator for up to a week and in the freezer for up to a month. Can You Substitute Dry Mustard for Prepared Mustard?